I remember my dad & my eldest brother always mentioning a BERT FRY,, he was a friend of my brother , & he was a union official in the royal docks. this was in the forties & fifties. Hi Caroline, thanks for the dates. I was in touch with a lady about 9 or 10 years back who wrote down all the Fry names for me (your dad's included), I can't remember her name offhand, I think it was June Fry? I have still got it in my family history box, I'll have to find it out, as you may know her. But I got all the baptisms from the online Essex records (SEAX) which gave me their dates of birth, parents & siblings names etc. I was also in touch with a bloke, again could have been 10 to 15 years ago, who was descended from Richards brother William (I think, memory is a bit rusty). When I told him that Richard & William had killed a bloke and they were sent to Pentonville, he didn't contact me again! Hi Ron, I've got two Albert Frys in my tree, one born in 1898 and one born in 1902. Like yourself I haven't gone into the Fry family in much detail. Every time I do I'm amazed at what I find! I only started researching into my ancestry in 2014 but then stopped due to family circumstances. Now I'm raring to go again! And finding you has been great to help fill the gaps. I was surprised at my great grandfather Richard Fry having both families on the go at once! I thought Richard Fry and Isabella Johnson only had 6 children. My granddad Harry (Henry Edward Fry) only knew and spoke of his sister Bella (Isabella Fry). My granddad knew Isabella Johnson because he called her aunty. I was also surprised to hear that Richard Fry and Annie Chapman had 9 children because we only know of 8. We've never heard of William. It was nice of you to tell me that Alfred Fry had another marriage to Alice Stepney nee Johnstone. That'll explain why there was 2 x Alfred Fry! I just presumed the eldest Alfred had passed away. But that's not the case because the eldest one was your great grandfather. Have I got that right? Sooo the youngest Alfred must have come from the Alfred Fry and Alice Stepney marriage? Hi Caroline, I've been doing my tree since 2002. I have done the Fry line right back to the 1700's. Our great granddad Alfred Fry born 21st July 1840 in Malmesbury, Wiltshire, married Mary Ann Pennington-Phillips. They had 9 children. Mary Ann died in 1893 & Alfred re-married to Alice Jane Stepney - nee Johnstone....they didn't have any children together, Alice had 6 children of her own. I did wonder if you knew June Mum's cousin Ginny used to see quite a lot of her, and it was Ginny who asked June for the info. Most of Richard and Isabella's children died very young, if you look at the dates they were only babies or toddlers when they died which is why your granddad didn't know them...its so sad really that they lost so many..... but the children he had with Annie lived a lot longer and into adulthood. Hi Sandra, thanks for the info. You truly are a mine of information! I know you've done a lot with regards to the Fry family and how far back you've got, just like I have. But I thought (wrongly) that you'd said you hadn't gone into much detail with them with regards to their marriages etc. One thing's for sure, you know more than I do! So the second Alfred Fry (1889-1918) I'm referring to is your Great Uncle. 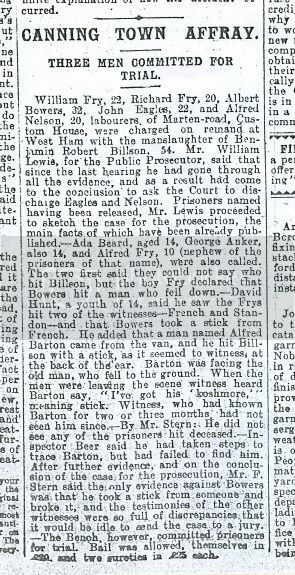 I think what confused me was the transcript from the Old Bailey of the trial of William Fry & Richard Fry where one of the witnesses was their young brother Alfred Fry aged 10. Who's this? That's why I thought (wrongly) Alfred Fry & Alice Stepney may have a child or two. It's sad to think that my granddad only knew he had 5 half brother's who died in infancy but there was more children who died. And also that he had another half sister called Annie Harriett who LIVED and he didn't know her! The only half sibling he knew was Bella (Isabella). He even used to see and call Bella's mum (Isabella Johnson) aunty! And what's even sadder is he never knew of his full blood siblings who died. Do you know if this William survived? He is a big mystery. I don't have any more info on William, so not sure what happened to him. I'll have to have a delve and see what I can find. The 10 year old was Nan's brother Alf (he died at sea in 1918) not sure why he said he was their brother and not their nephew...doesn't seem right a 10 year old giving evidence at the Old Bailey does it. Also in one of the News of the World newspaper reports, it says Alfred is the nephew (have attached the report). I'm such a numpty! After I posted my last message regarding 10 year old Alfred I went to bed reading the transcript and saw the mistake that was made about Alfred being their brother and then further down it said he was their nephew. Bingo! I'm still excited at finding a long lost relation. It's blooming marvellous! I was flabbergasted at my ancestry which was uncovered by Annette, www.dajevue.webs.com. You can also call her on 07725 908728. Hi Dan, I have been researching my Ancestry for 14 years, I don't need to pay someone to do it for me as I enjoy doing it myself. Thank you anyway. My cancer treatment has now finished and I am getting back to normal, back at work etc. And back at the Family History. The only thing is, my computer died January time. Luckily I backed up all my family history data, but I lost all my email addresses including yours. So not sure where we got up to Fry history wise, as when we were last speaking I was going through chemotherapy. Have you done any more research? or is there anything you'd like to know about the family?